Shortly after the Hollywood Fringe Festival, I read a review in the LA Post-Examiner about a production of I Love You, Because at the Hudson Theatre. I had heard the music from the show before (I have the CD), and wanted to see it; unfortunately, I just couldn’t fit it into my schedule before it closed. Luckily for me, I learned about a different production being produced by someone I knew from my Temple Beth Torah days that was opening in September. The show’s schedule and my schedule were able to mesh, and so last night we were out in Burbank to see the Red Brick Road Theatre Company† (FB) and Endeavor Theatre Ensemble’s production of the Cunningham and Saltzman musical “I Love You, Because” at the Grove Theatre Center. I Love You, Because is a musical about… well, let me start by telling you what everyone says it is about. Everyone says — that is, it seems to be that every review of the show that you will read will say — it is a modern twist of Jane Austen’s Pride and Prejudice. Now, I haven’t read Pride and Prejudice, but I have read the Wikipedia summary, and I have difficulty seeing the purported connection. My advice: ignore that claimed aspect of the show, as it appears to be tenuous at best. Beside that, there are no zombies. So what is I Love You, Because about. To me, it is a comedy squarely in the center of the off-Broadway subgenre of small cast comedies about finding love in New York. You know them: shows like First Date; Brownstone, The Musical; Five Course Love; I Love You, You’re Perfect, Now Change; I, Sing; Little Shop of Horrors… oh, right, no zombies. In any case, shows about some small number of couples seeing to find love through endless dating, finding Mr. Wrong, and then finding Mr. Right. I don’t know why they are always in New York — perhaps Gothamites are much worse at finding love, or perhaps Gothamites will only go see a show if it is about their city (whereas LA folks care about love in New York, perhaps New York doesn’t care about LA). In any case, I Love You, Because is squarely in the “looking for love” genre of musicals. In this case, we have two young and beautiful gothamites: Austin and Marcy. Each has just been dumped by their long-term paramores. One, Marcy, would just like to move on, but her best friend Diana convinces her that she absolutely must wait the proper amount of rebound time. The other, Austin, wants to win back the love of his life, but his brother, Jeff, convinces him that he must go out and date again, for only then will the universe restore balance by bringing the woman that dumped him back. If you hadn’t realized it yet, both of the sidekicks are pretty cynical about love itself and neither has any realistic hope or want of finding a relationship. So the two sidekicks happen to set up a date with each other, and happen to bring along their best friends so they can meet and force the universe to do what they want. The universe is perverse, so you can guess what happens. That’s right, Austin and Marcy start seeing each other: her to have something to pass the rebound time with; him to have someone help him right the perfect poem to win his girl back. There’s no interest of the two in each other, as they are stereotypical opposes: he a straight-laced Republican; she a free-spirited Liberal. As I said, you can guess what happens; I probably shouldn’t spoil it too much. As for the sidekicks, you can probably guess what happens there. After all, you’ve see Mike and Molly. That’s right: they become friends with benefits. By now you can see where this is going, and anticipate where things will end up. There is a crisis at the end of Act I prompted by the profession of actual feelings; Act II serves to resolve those feelings and bring everything to a happen ending, with the help and lubrication of two nameless supporting cast members who serve various roles, including as bartenders and waitresses (something every actor in New York knows how to play well). Overall, I found the story a bit sitcomish, but enjoyable and funny and cute. That may be because the characters were written a bit broadly. Others in the audience were guffawing and finding it hilarious throughout — I’m not that demonstrative, but there are some very cute bits. There could be an age factor in this: the humor may hit even more to those who are closer to the modern dating world than I, an engineering type who married another engineering type and never really explored the dating scene (except with other mathematicians, scientists, and engineers). Part of this could be due to the fact that this was an early work from the authors, Ryan Cunningham (Book and Lyrics) and Joshua Saltzman (Music). The team does not have a lot of musicals under their belt, and often the oeuvre of a team matures over their production span. In many ways, the lyrics and music were a bit stronger than the book itself. Many of the songs were very cute and the audience could relate to them. Good examples of this are “We’re Just Friends”, “Coffee”, and “That’s What’s Gonna Happen”. Of course, there is the very strong “The Actuary Song”, which makes one think of the heist planning in 70 Girls 70. On the other hand, there were some klunky-ish songs such as “…But I Don’t Want to Talk About Her”. One thing that was notable here was the casting, for which there is no specific credit (so it was likely a combination of the director and the producers). Most productions of this show, judging by the cast pictures, tend to select a uniformly white, good looking, model-proportioned cast. This production was far from that. Of the three female cast members, two were on the fubsy side, the third was a person of color. The male side was a little less diverse, although that is understandable given two of the three characters are brothers. But it was truly a nice thing to see on the stage — especially as -ism based on size has been about the only -ism to remain common. ETA: Photos from the production have been posted on the production’s Facebook page. Let’s turn to this cast, under the direction of Carol Becker (FB). In the lead positions were Laura Bevilacqua/FB as Marcy and Nick Echols (FB) as Austin. Let’s start with the basics: I was smitten with Bevilacqua’s performance. She had a remarkable personality, a dazzling smile, wonderful expressions and reactions and an extremely strong singing voice that did not require the amplification that it had. She was just a joy to watch, especially when she wasn’t the center of the action and was just reacting. Echols seems to start out a bit stiffer (this was, after all, the second performance of the show) and to have some amplification problems, but as the show progressed he became a much warmer character and less of the stereotype he began as. (boy, that was a convoluted sentence). One other thing worth noting was the size difference between the two: even in her heels, Bevilacqua was at least a head shorter than Echols. It was fun to watch them navagate around that. In the sidekick tier, we had Kristen Bennett/FB as Diana and Matthew Ian Welch (FB) as Jeff. Bennett and Welch just seemed wrong for each other, yet the pairing work. No where else was this clearer than in the “We’re Just Friends” song, where the two are clearly having a load of fun. Bennett had a very strong gospel style voice, and Welch had an amazing baratone that just seemed to come from nowhere. Rounding out the team in various character roles were Ali Deyer (FB) as the “NYC Women” and Tim Jim Lim/FB as the “NYC Men”. I really liked Deyer — it was nice to see someone who was zaftig on stage where it wasn’t being played for the funny, but just as a normal character with a normal life. Deyer also had a strong singing voice. 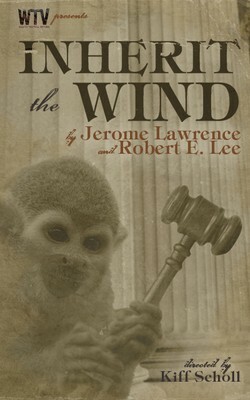 I was less crazy about Lim — his characterizations were a bit over the top and at times bordered on the stereotypical; I was also not enamored of his singing voice, which was a bit weaker than the other two men in the cast. Lainie Pahos (FB) was the understudy for Marcy/Diana. The on-stage musicians were under the musical direction of Stephanie Deprez (FB), who was on stage playing as much as the actors (she was a hoot to watch). The “orchestra” consisted of Betsi Freeman (FB) (Piano), Glenn Ochenkoski (Drums), Mark Corradetti (FB) (Bass), and Jeff Kroeger (Keyboard). Choreography was by Liza Barskaya (FB) and worked pretty well given the space — again, I particularly enjoyed it on the “We’re Just Friends” number. Turning to the production and creatives side. The set design by Carmi Gallo was reasonable: it didn’t give a strong sense of New York other than the pictures hanging on the wall; additionally, there was this odd red LED shape at the back that would turn on occasionally. It was unclear what that was meant to convey; hence, it served primarily to distract. Properties design was by Rebecca Kahn/FB, and they worked reasonable well — especially all of the fruity drinks and such. The sound design from Jay Lee was problematic: there was bad balance between the actors and the music; in that size space, the music needs to be toned down and the actors — especially these actors — do not require much amplification. As it was, it was a bit overpowering. The lighting design by Robert Davis conveyed the proper sense of mood and time, and thus worked well. The costume designs by Christine Macedo were strong — I particularly enjoyed the costumes on the lead actress (remember, I said I was smitten); all conveyed that sense of New York design that doesn’t work as well in LA :-). Rounding out the production credits were: Becky Murdoch/FB, Assistant Director; Owen Panno (FB), Stage Manager (who didn’t recognize us from the many years ago where we frequented TDWA in Northridge with all the Nobel grads); and Emily Mae Heller (FB) and Betsi Freeman (FB), Producers. 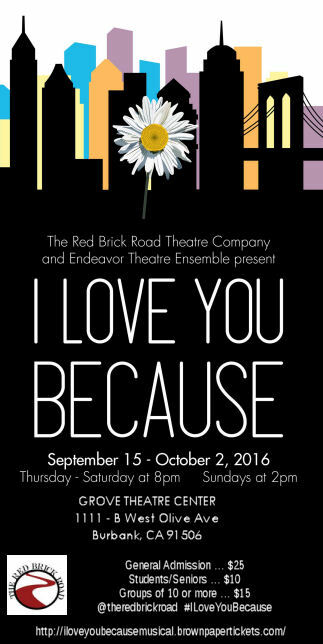 I Love You, Because continues at the Grove Theatre Center (FB) through October 2nd. Tickets are available through Brown Paper Tickets; they do not appear to be up on Goldstar. I found it a fun and cute show — not deep, but fun — and a nice way to pass the evening. Upcoming Shows: The last weekend in September brings The Hunchback of Notre Dame at The La Mirada Theatre for the Performing Arts (FB). October is a bit more booked. The first weekend brings Dear World at the Valley Performing Arts Center (VPAC) (FB) and Our Town at Actors Co-op (FB), as well as the start of the High Holy Days. The second weekend has another Valley Performing Arts Center (VPAC) (FB) event: this time for Jazz at Lincoln Center Orchestra with Wynton Marsalis. The third weekend has yet another VPAC event: An Evening with Kelli O’Hara on Friday, as well as tickets for Evita at Cabrillo Music Theatre (FB) on Saturday. The following weekend brings Turn of the Screw at Actors Co-op (FB) on October 22 and the new Tumbleweed Festival (FB) on October 23. The last weekend of October brings Linden Waddell’s Hello Again, The Songs of Allen Sherman at Temple Ahavat Shalom (a joint fundraiser for MoTAS and Sisterhood). I discover the shows I go to in many ways. For the theatres to which I subscribe, they pick the shows for me; in fact, that’s one reason I subscribe — to discover shows I might not otherwise pick. But the vast majority of shows I see I pick. I learn about them through promotion by Goldstar and LA Stage Tix; I learn about them from emails from publicists (they seem to think I’m a critic — I may write up the shows I see, but I’m computer security guy and professional audience). I learn about them from ads in programs (such as Footlights). I often learn about new musicals from Ellen Dostal’s excellent blog Musicals in LA. [and I should plug that I monitor this stuff with an excellent RSS reader, Newsblur, which is a great way to keep on top of websites]. Ellen’s blog alerted me to the show we saw last night — the 20th Anniversary production of Inside Out (FB) at the Grove Theatre Center (FB). I had been looking for a show for this weekend, and just didn’t find one that screamed “come and see me”. Chavez Ravine at the Kirk Douglas came closest, but I couldn’t find tickets. This show called to me for a number of reasons: (1) it was a musical; (2) I had heard good things about Adryan Russ (FB) and her music before; (3) Bruce Kimmel (FB) was involved, and we’ve liked the shows he’s done in the past (one, two, three); and (4) the subject matter sounded interesting. The net result: the first of two weekends seeing shows in Burbank. The verdict: This one is worth going to see — great performance, great musical, and a grand time. 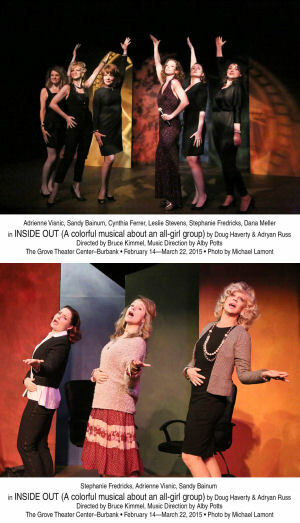 Inside Out (with book by Doug Haverty (FB), music by Adryan Russ (FB), and lyrics by Doug Haverty (FB) and Adryan Russ (FB)) tells the story of a girl group. But not that kind of girl group — this isn’t Baby It’s You or some other jukebox musical. Rather, this is the story of a woman’s therapy group in the 1980s. This provides the opportunities for the women to talk and work out their problems, which provides the authors the opportunity to comment on the issues women faced with careers, the balance of work and family, and relationships. It also provided the opportunity to comment on failure and the path of recovery from failure. This could have been a sit-and-talkfest; the fact that the participants sing through their problems is just an unsaid given. It’s the norm of the universe established in the first song. Given the nature of this musical and this universe, the plot isn’t your traditional “tell a story” plot that one might see in Oklahoma. Instead, the plot is more on the order of A Chorus Line — learning the back story of a bunch of characters and watching them grow and change as they tell their stories and interact. For this to succeed, the mix of characters has to be right. Luckily, the authors chose a good mix: a mom who is dealing with changing body image issues after having children; a successful business woman with a stay-at-home husband and teenagers; a flighty CYT (cute young thing) into numerology and such; and a lesbian banker with a rapping teen son. The impetus for the show is the addition of a new group member: a well-known pop musician who hasn’t published anything or performed in years. The group discussions (and the songs presenting those discussions) touch upon a number of “touchpoint” subjects: the desire to be thin, the desire for a good relationship, what women want from men, the growth and depth of relationships, facing one’s fears, and taking chances. That the show successfully does that was reflected in the reactions of the women audience members — and I’m not talking just about those that know the cast members, but those that paid to be there (such as my wife, who thoroughly enjoyed the show). I’d venture to say that another reason for success was a directoral light touch. But in reality, I have no idea what the “touch” of the director, Bruce Kimmel (FB), was — and this is a good thing. I tend to believe that the sign of a good director — just like good sound and lights — is that they are transparent. You think everything is coming naturally from the actors. In this show, I couldn’t see obvious signs of overt direction — it all seemed that these were natural characters who loved being themselves. I guess that means there was good direction. My favorite was Adrienne Visnic (FB) as Sage, the “freethinker”. She just radiated in the role — happiness, bemusement, joy, rapture. It was just a delight to watch her face — not only when she was upfront singing a song, but when she was in the background reacting to the other performers. She was very strong in her numbers, particularly “I Don’t Say Anything” and “Let It Go”. “I Don’t Say Anything” was a number that particularly hit home, as I could sense my wife thinking many of those thoughts about me :-). “Thin” brings us to the next actress I really liked (OK, I’ll admit it, I liked them all): Dana Meller (FB) as Molly. Meller’s first number, “Thin”, did a perfect job of establishing her character and echoing with the audience (as it touched on body image issues); her major number in the second act, “The Passing of a Friend” was also a hit. Again: great singing, great reaction, great interplay with the other characters and a delight to watch. I’ll note we’ve seen Meller before in both Insanity and Pest Control at the No Ho Arts Center. I still fondly remember Pest Control, and wish it would be revived and have a cast album. Sandy Bainum (FB) was strong as Liz, the high powered corporate executive. I initially didn’t warm to her character — I’m not sure if it was her look or the attitude she gave off. However, by the second act when the character loosened up, I was sold. She was great in her “Do It At Home” number, and just watching the transformation of the character was great. For Dena — the character who seemingly was the focus of the group — we didn’t have the main player, Leslie Stevens (FB). Rather, we had the understudy, Jill Marie Burke (FB). Burke had a very different look than the other characters, and as with Bainum’s character, I was initially cold. Yet again, however, the performance won me over — by the second act as the character warmed up to the environment and the group, she shone. Burke nailed it on the songs and did great on the lines (one or two hesitations, but hey, this was an understudy situation, so they were truly minor). All of her numbers were great, but I’ll particularly highlight her second act numbers, “All I Do Is Sing” and “Reaching Up”. Of course, if her character really wants to find a venue where she can sing again, she should look no further than LA’s vibrant 99 seat theatre scene. More on that in a minute. Lastly, bringing all these women together was the group therapist, Grace (Cynthia Ferrer (FB)). I could have sworn we had seen Ferrer before, but her name doesn’t appear in any of my writeups. I’m guessing this is because her character exuded that comfort and familiarity. She shone in her Act Two opener, “Grace’s Nightmare”. The musical numbers were staged by Bruce Kimmel (FB) and Leslie Stevens (FB). Music supervision was by Alby Potts (FB), who provided the offstage music with someone else whose name I didn’t write down and who doesn’t appear to be obvious in the program. The movement and dance worked well, particularly in Dana Meller’s numbers. Music was strong throughout. Music arrangements were by Ned Ginsberg (FB), with vocal arrangements by E. Suzan Ott. This brings us to the technical side — and the only quibbles with the show. The set design was by Rei Yamamoto/FB, and was very simple — some colored panels, and some office chairs. As they say, no expense was spared :-), but then again, this show has no real locations that had to be created, and the lack of a fancier set allowed the focus to be on the women themselves. Costumes were by Natalya Shaninyan (FB) and provided the quibble from my wife. I’m a guy — I wouldn’t know 80s fashion from a hole in the ground. My wife noted that some of the costume decisions were clearly of the wrong era — in the 80s, there wouldn’t be bare legs, there would be hose and shapers. Similarly, there were some comments from her on blouses tucked vs. untucked. I enjoyed the costumes, but wives often see things that we don’t :-). The sound by Josh Benton was clear and worked well. The lighting by Maarten Cornelis (FB) mostly worked — there were points, in my opinion, where the stage was a little too dark and the actors couldn’t be seen (and they weren’t intentionally in shadow). Remaining credits: Victoria Chediak (Stage Manager); Maggie Marks (Props / Production Stage Manager), Art + Soul Design (Graphic Design), Michael Sterling (Publicity), Joanna Erdos (FB) (Associate Producer), Kritzerland Entertainment and Play Works Music (Producers). 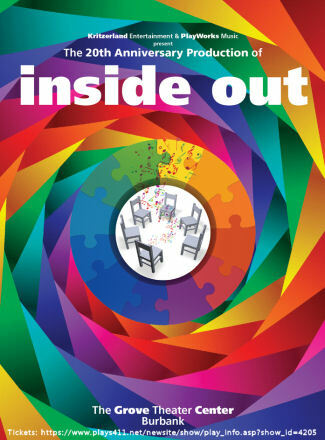 The 20th Anniversary production of Inside Out (FB) continues at the Grove Theatre Center (FB) in Burbank through March 22, 2015. Tickets are available through Plays411. 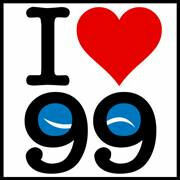 Discount tickets may be available through LA Stage Tix and Goldstar. It is well worth seeing. Upcoming Shows: February concludes with a lot of theatre in Burbank. Next weekend bring two more Burbank performances: the Good People Theatre Co (FB)’s production of Maltby/Shire’s Closer Than Ever at Hollywood Piano in the afternoon, and “The Road to Appomattox” at The Colony Theatre (FB) on February 28. March is equally busy, with the MRJ Man of the Year dinner on March 7 (and a Purim Carnival at TAS the next day), “Carrie: The Musical” at La Mirada Theatre for the Performing Arts (FB) on March 14, a “Drowsy Chaperone” at CSUN on Friday March 20, “Doubt” at REP East (FB) on Saturday March 21, “Newsies” at the Pantages (FB) on March 28, followed by Pesach and the Renaissance Faire on April 11. Other than the Faire, April is pretty much open (as is May), but I expect that to start changing soon (for example, I just booked “Loopholes” for the first weekend in May). As always, I’m keeping my eyes open for interesting productions mentioned on sites such as Bitter-Lemons, and Musicals in LA, as well as productions I see on Goldstar, LA Stage Tix, Plays411.